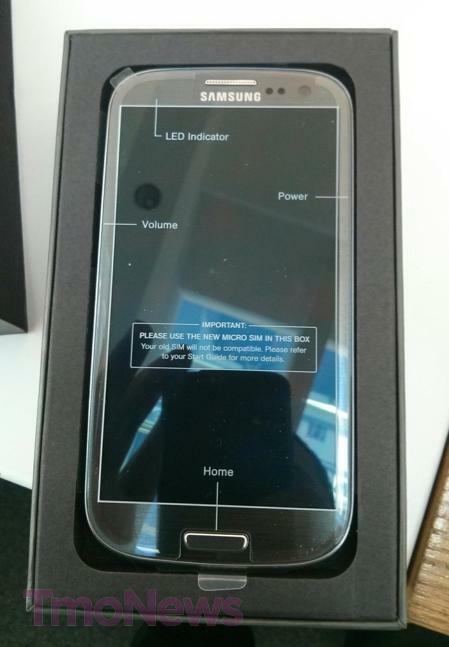 Update: T-Mobile has confirmed the Titanium Gray Galaxy S III is an HSPA+ 42Mbps device. 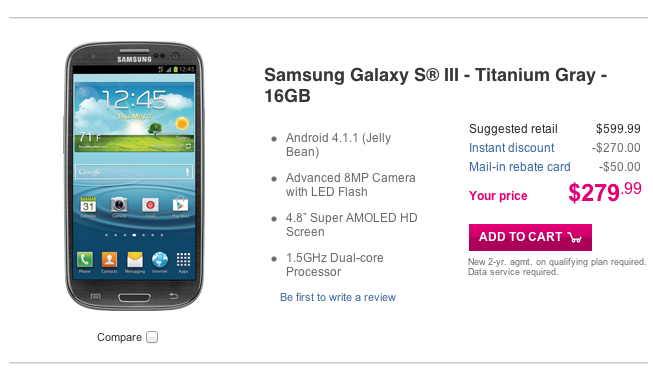 As expected, T-Mobile has released a 16GB Titanium Gray Samsung Galaxy S III to the world. Word has it most T-Mobile owned retail stores have already received their inventory of the device and I finally caught the device on T-Mobile’s website this morning. Perhaps it was on my end, but I glanced at the website a few times yesterday and didn’t see it listed as available. Regardless, the 16GB Titanium Gray replaces the 16GB Pebble Blue model, which will not receive replenished inventory. The 16GB Marble White model will continue to be available as well. However, the 32GB Pebble Blue model will continue to be available for purchase through T-Mobile’s website. Along with T-Mobile’s own retail locations, national retail and authorized T-Mobile dealers should also have the Titanium Gray model available to sell as well. No changes to pricing were announced. I like the color, but with the LTE changes and S4 around the corner I’m hard pressed to make any device changes until later. didn’t tmonews just write an article on how this samsung galaxy s3 grey release will get updates ota for lte? I can’t confirm if this model has LTE or not, I’ve reached out to T-Mobile to confirm. T-Mobile didn’t say anything about the Titanium Gray edition having LTE at their press event on Tuesday so it’s hard to say for certain. What’s weird is that if you go into the the mobile network settings and the options on what type of network to use, lte/gsm/wcdma is one of the options. Not sure if anyone has caught that since the Jelly Bean update. I caught it as well. Would love to know what this means. MANNNN forget the xtra colors….wheres 4.2!!!!!! I think this is bad timing considering anyone who paid attention to CES knows Tmobile will be releasing an LTE model. Kinds of sad actually, but then who’s to say the ones who do end up buying it care or realize that LTE and HSPA+ are any different anyways. I mean people still buy 720p TVs even though 1080p is better. I can’t complain though, I will still be rocking my 32gb S3 because HSPA+ is still plenty fast. I know, it’s a whole 360p more! I’m sure they’ll cost the same. If you mean the GS3, hopefully, but who knows? For all we know, it’ll also have the quad-core Exynos. Not the case with me. I went with the 720p because I could differentiate the difference with the 1080p. That and most HD broadcasts are in 720p. Blu-Rays comprised the majority of the 1080p market when I bought my TV so it really wasn’t worth the extra money to me. Also, yeah, I guess it would have been better to say that they don’t feel 1080p is worth the extra cost. How much do you want to bet this is the reason why the blue 16gb are no longer being sold. Maybe to get rid of the extra inventory faster they had Samsung change the color of the plastic casing since it would cost less than losing money on the extra inventory completely due to the LTE model launch. Plus it would spice things up a bit to get rid of it faster since it would be a new color to entice people while we wait for the LTE models. Could also be the reason why they kept the blue 32gb models in stock because there wasn’t a many to begin with and they figured if someone really wanted the blue model, buying the remaining 32gb models without LTE would be the way to do it. An idiot that knows how it works. How else could they get rid of the extra inventory with an LTE model just around the corner. Maybe this isn’t the case but my idea would make sense if you didn’t want to lose out on too much money and wanted to get rid of the remaining inventory quicker. Just think about name brands and their logos. When the brand starts to lose momentum they spruce up the logo a bit to freshen it up or change the package. It’s the same old phone but with new packaging. Why else would they announce a new color after they already announced an LTE version? You are aware the new phones have to be manufactured with the new colors, right? Creating new phones creates more inventory, not less. Selling existing phones reduces inventory. Yes, but they could easily reuse the internal parts of the phone and just replace the outer plastic parts. It wouldn’t be that hard or expensive to do. Last I heard plastic is recyclable. It’s not like Tmobile just found out they were getting LTE, heck we knew about it when the original S3 launched. I just find it odd the blue 16gb is now discontinued yet they announce a new color that is 16gb yet it’s not LTE compatible either. Why didn’t they just wait to release the new LTE model in gray? Pebble Blue, White, Titanium and without LTE so what! :-P It’ll be enclosed in a protective case in most cases anyway! I thought they all were HSPA+ 42mbps? You’d be a fool to buy one of these now with the LTE ones coming out so soon. So what’s different besides the color? Not available for upgrade customers, only new customers! After waiting till the 9th to order this because I didn’t want a blue phone I was pretty pissed off…false advertising…they said it would be available across the board by the 9th, clearly they lied! I went to the store and picked one up on the 5th. I don’t deal with the stores anymore, I don’t like their exchange/return policies charging people. Buying it online/phone is much easier and there is no fees to return or exchange. I just picked up the blue, was going to get that anyway before finding out the titanium was coming out so it will be fine. Plus “loyalty” gave me 50 off the price (including the downpayment) and a 50.00 mail in rebate because of the issue. No complaints here.